Not PC: Happy July 4th! With bailouts to failures, subsidies to things that shouldn’t be and rampant attacks all round on freedom and capitalism, it would be hard to call the year so far a good one for America's founding fathers—or for the freedom and liberty they sought to cement into the America they founded. Yet with Supreme Court decisions affirming (first) the constitutional right to self-defence, and then (second) annulling the government's power to arbitrarily slap moratoria on business, and the the rise of tea parties in which at least some of those involved understand the moral arguments behind the constitutional republic the founding fathers created (and who understand that it was a constitutional republic they created, not a democracy) it can’t be said that things are beyond hope altogether. Which is as important to us, in New Zealand, as it is important to them, in the States. Because however much New Zealanders might like to ignore it, the events that Independence Day celebrate are as important to us down here as they to those up there. July 4 isn’t just a day to celebrate American independence, but our own as well. What do I mean? Why does it matter to us down here at the bottom of the South Pacific that a bunch of gentlemen over two-hundred and thirty years ago pledged their "lives, fortunes and sacred honour" to constitute the first government in history dedicated to the task of protecting individual rights -- as expressed in Thomas Jefferson's magnificent Declaration of Independence, the rights to life, liberty and the pursuit of happiness? Why should that matter to us? As Michael Berliner explains, "Jefferson and Washington fought a war for the principle of independence, meaning the moral right of an individual to live his own life as he sees fit." The principle of independence for which they fought is universal. The United States of America was the first and still the only country on earth to be founded upon the specific idea that human life and human liberty are sacred. Upon the idea that individual rights be held sacred. July 4th is (still)that day when freedom's anthem is heard around the world! Despite its occasional breaches in upholding the principle of human rights and human liberty consistently, it is nonetheless for this that we all celebrate (or should celebrate) Independence Day. That for the first time in human history a country was founded on the idea of human rights and human liberty; upon the notion that "life, liberty, and the pursuit of happiness" are sacred; upon the intention to constrain government to act only in defence of those rights. This was not just a unique event in human history, it also worked like all hell for nearly a century-and-a-half; it worked because protecting those rights gave individuals the moral space, the freedom, within which to act and to flourish. 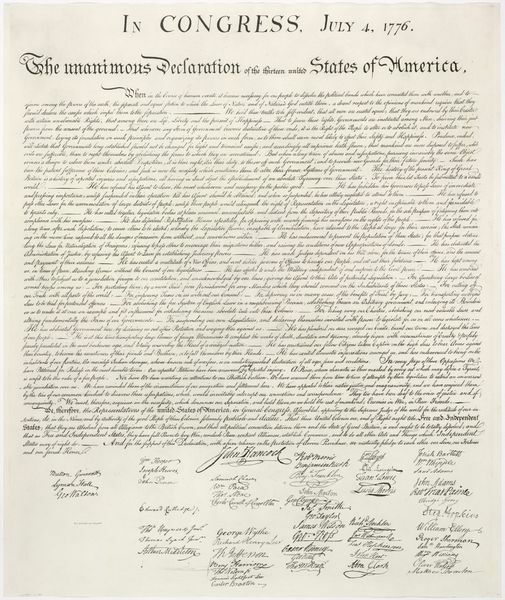 It was not just that this made America and the world freer and more prosperous (which it did); it was not just that this protection for liberty gave a platform to criticise and remedy the breaches of the principle (which it did, most notoriously the regarding of some human beings as the property of others); it is also the profoundly important illustration that a country founded upon reason, individualism and freedom works. That liberty is moral. That liberty is right. 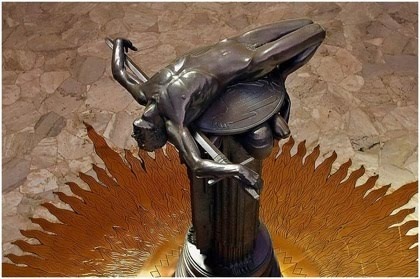 May it be to the world, what I believe it will be (to some parts sooner, to others later, but finally to all), the signal of arousing men to burst the chains under which monkish ignorance and superstition had persuaded them to bind themselves, and to assume the blessings and security of self-government. That form which we have substituted, restores the free right to the unbounded exercise of reason and freedom of opinion. All eyes are opened, or opening, to the rights of man. The general spread of the light of science has already laid open to every view the palpable truth, that the mass of mankind has not been born with saddles on their backs, nor a favored few booted and spurred, ready to ride them legitimately, by the grace of God. These are grounds of hope for others. For ourselves, let the annual return of this day forever refresh our recollections of these rights, and an undiminished devotion to them. 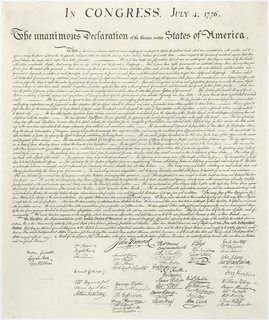 To really celebrate Independence Day, Americans must rededicate themselves to the principles of 1776, and particularly to the absolute importance of individual rights – not the pseudo-rights imagined by proponents of the welfare state, but the genuine rights (properly understood) of individuals to life, liberty and the pursuit of happiness. We must also rededicate ourselves to the Declaration’s standard for the legitimacy of government – a government that is limited to the safeguarding of these rights, not to their destruction – and, with this, an acceptance of the principle that outside this sphere of legitimacy, individuals have the freedom (and the responsibility) of governing themselves. If Americans are to use this day to re-dedicate themselves to the principles of 1776 as Mayer invites, then non-Americans might use it to take up Thomas Jefferson's challenge "to burst the chains under which monkish ignorance and superstition had persuaded [us] to bind [ourselves], and to assume the blessings and security of self-government." Human liberty is the most sacred thing in the universe, and today is the pre-eminent day in which to celebrate it, and to salute the authors of America's Declaration of Independence. To America's heroic founders, I salute you! For the very best version of Star Spangled Banner to play over a martini or your Sam Adams, I recommend Licia Albanese's spontaneous combustion at a Mario Lanza ball a few years ago. Fortunately, Lindsay Perigo was on hand to record the eighty-year-old drowning out the young tenor who was supposed to be taking centre stage. Imagine the scene, click on this link, turn your speakers up to eleven, and just bask in the magnificence! "As it is apparent to all that a prince is constituted by God to be ruler of a people, to defend them from oppression and violence as the shepherd his sheep; and whereas God did not create the people slaves to their prince, to obey his commands, whether right or wrong, but rather the prince for the sake of the subjects (without which he could be no prince), to govern them according to equity, to love and support them as a father his children or a shepherd his flock, and even at the hazard of life to defend and preserve them. And when he does not behave thus, but, on the contrary, oppresses them, seeking opportunities to infringe their ancient customs and privileges, exacting from them slavish compliance, then he is no longer a prince, but a tyrant, and the subjects are to consider him in no other view. And particularly when this is done deliberately, unauthorized by the states, they may not only disallow his authority, but legally proceed to the choice of another prince for their defense. This is the only method left for subjects whose humble petitions and remonstrances could never soften their prince or dissuade him from his tyrannical proceedings; and this is what the law of nature dictates for the defense of liberty, which we ought to transmit to posterity, even at the hazard of our lives. And this we have seen done frequently in several countries upon the like occasion, whereof there are notorious instances, and more justifiable in our land, which has been always governed according to their ancient privileges, which are expressed in the oath taken by the prince at his admission to the government; for most of the Provinces receive their prince upon certain conditions, which he swears to maintain, which, if the prince violates, he is no longer sovereign." Sorry, Peter, it seemed my comment was too long to post, and then Blogger suddenly accepted all versions, while I was trying to prune it a bit. I also spout 4th july.